"When a church does not reference its denomination in the church name, unchurched people tend to see that church as less formal, rigid, and old-fashioned," notes the Phoenix-based market research firm in a news release. "But this also makes them feel more uncertain and wonder whether the church is trying to hide its beliefs." Four times more likely to be perceived as "formal." Three times more likely to be perceived as "old-fashioned." Almost three times more likely to be perceived as "structured and rigid." Three times less likely to be perceived as "open-minded." The image came from this site. 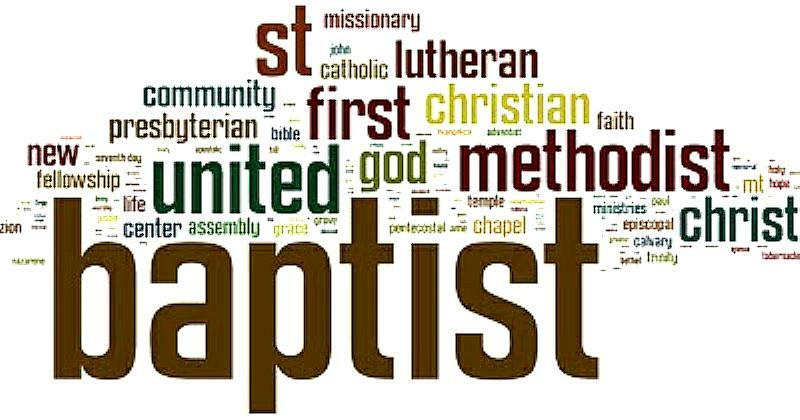 Christianity Today Gleanings: Should Your Church's Name Include Its Denomination?